The University Oaks Criterium is a small crit that happens four or five times a year in an office park on the north side of SA. The purse is small so it doesn’t pull deep talent from across the state, which makes it a perfect place to work on technique while also getting a fast race in the legs. I saw this week’s race as an opportunity to work on some weak points identified during Alsatian; gain confidence in my cornering and get some practice hitting turns at full speed while in a small group. 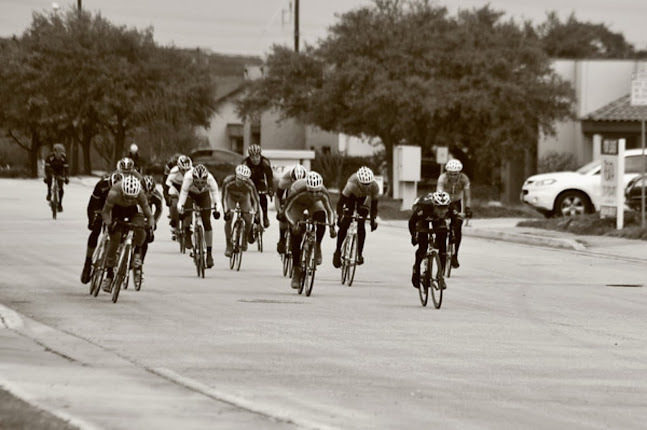 Despite the 40 degree weather and rumors of sleet, Jim Day and I made the trip to San Antonio to race this year’s first edition of the University Oaks Criterium, put on by Kickstand Racing. When we pulled up to the race, it was as cold as promised, and immediately after Jim made the comment “at least it’s not raining,” the sleet began to fall. There were a lot of unenthusiastic bike racers milling about the registration tent, most joking about not wanting to race, some meaning it. I killed as much time as possible huddled next to the heater under the Nelo’s Cycles tent (thanks to the foresight of Christopher Stanton from the Ghisallo Foundation), but after watching my old teammate Colin Strickland (Jack and Adam’s Racing Team) take 2nd from a 3-man break in the 3/4 race, it was time to get kitted up. After a short warm-up, I lined up for the P/1/2/3 race. Kristian House (Rapha Condor Sharp) also made the trip from Austin and pretty much walked away with the race, leaving the rest of us to chase like mad for most of the hour. During the race, I tried something my teammate, John Trujillo, suggested about learning how to corner without fear: endlessly repeat “No brakes. No brakes.” As simple as it sounds, that’s the gist of my plan to become a better technical rider. When approaching a corner with any amount of speed, especially when in close proximity to other racers, a little voice comes on inside my head and tells me to slow down. It usually manifests with an uncomfortable feeling; a nervousness in the pit of my stomach. On Sunday, I made the effort to quell that little bugger, and John’s mantra helped to give me something to focus on instead of the fear. And one from last weekend during the Alsatian Crit. 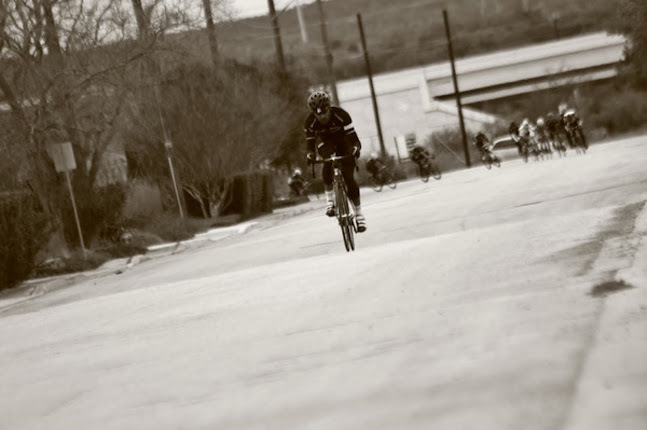 And this is one that Robert Mercado took during the UO Crit this past weekend. Notice the difference in where my fingers are. Progress! By keeping my fingers off the brakes in the lead-up to a turn, I’m simply forcing myself to add a priming step to the braking process, which gives me one extra instant to re-evaluate the need to brake under those circumstances. Now, I want to elaborate that I’m not taking risks that will put my fellow racers in harm. I know there are times when brakes are absolutely necessary, which is why I wanted to practice this bit of self restraint at University Oaks before doing it in a bigger, faster, fuller race. The course on Sunday is one that can be taken at speed. Brakes are not needed, but it is tricky to get the brain to believe it. Did it help? You bet it did. I was able to carry more speed into the corners, rarely letting gaps open. This translated into increased efficiency; I wasn’t spending energy every lap sprinting to get back into the draft of the guy in front of me. At the end of the race, especially when the speed was picking up for the sprint, I felt more comfortable. I was able to stay in position in the lead-up to the sprint and gave me a much better chance at the end of the race. I still miss-timed my jump and could have made other improvements during the race to put me in a better position at the end. I ended up grabbing 4th in the field sprint. Can’t fix everything in a day, but a week can make a hell of a difference.